This fudgy, rich dark chocolate brownie cake is loaded with two kinds of chips and decorated with a simple dark chocolate drizzle. 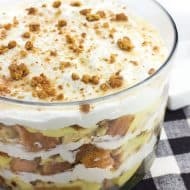 An easy dessert to feed a crowd! 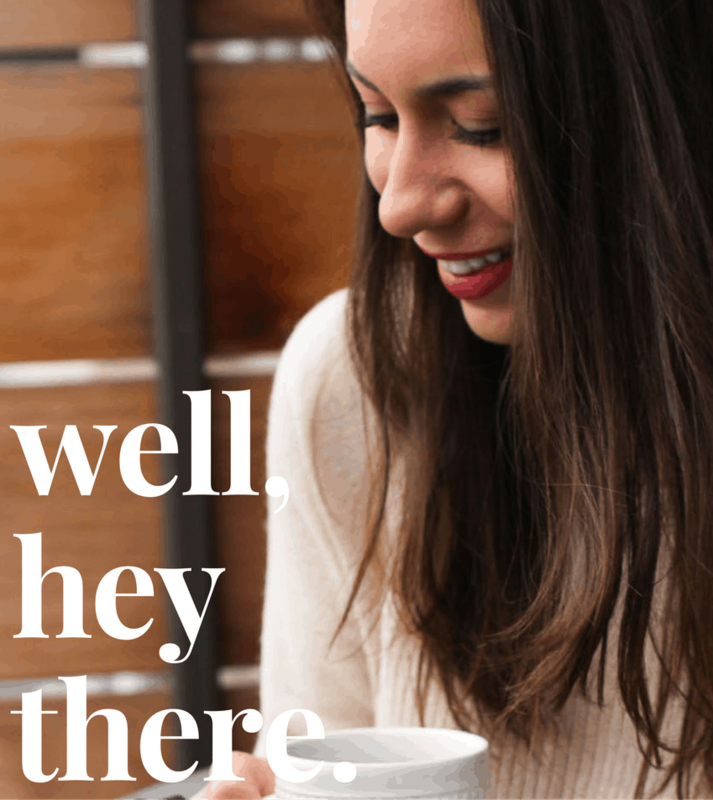 Let’s talk about Easter being THIS Sunday. Huhhwhaa? I’m sure just a second ago it was February and I was snacking on Valentine’s Day candy. In a snap those chocolate hearts turned into chocolate eggs…and I’m totally okay with it. Gimme gimme springtime. At a time when many people are on vacation or looking forward to some time off, my job is turned up to 11 in terms of workload and deadlines so I won’t be taking any time off. It ain’t easy being an accountant in the early spring! I can tell you now that my coffee consumption will go up this week, along with my Foo Fighters listening (motivational tunes!). What else will I be leaning on to get me through this week? 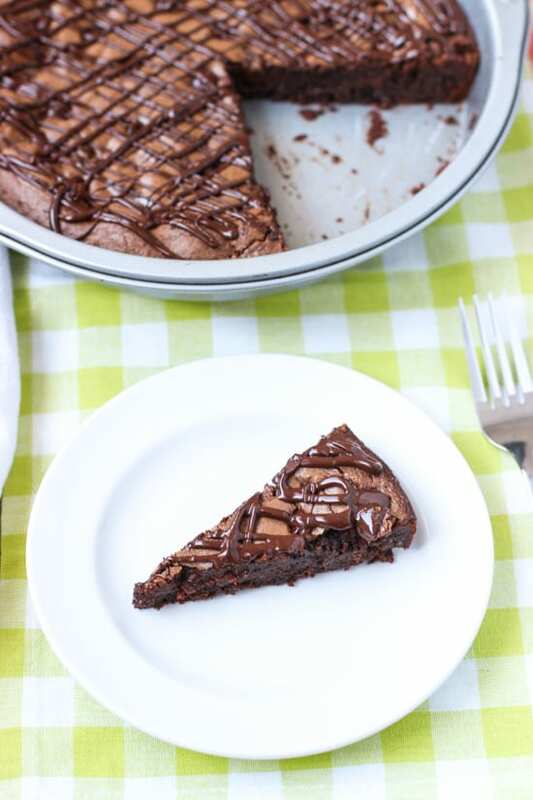 Slices of this fudgy dark chocolate brownie cake, covered in a simple dark chocolate drizzle! 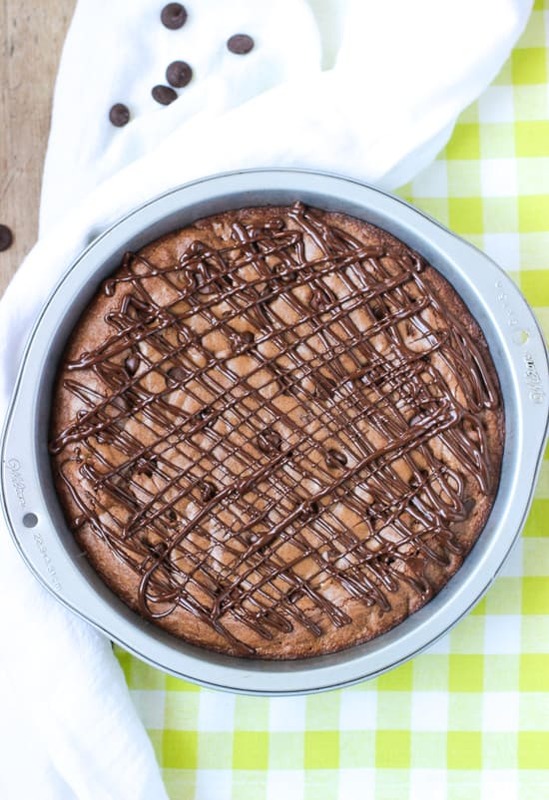 This brownie cake is a snazzed up brownie recipe, baked in a 9″-round cake pan, and cut into slices. It doesn’t take much more work than preparing a typical brownie recipe, but is fancied up to feed a crowd. Maybe you’re having a crowd over for Easter Sunday and haven’t decided on a dessert yet? This one is for YOU. I adapted this brownie recipe from one of my favorite cookbooks, The Art & Soul of Baking by Cindy Mushet/Sur La Table . No kidding, sometimes I read it leisurely before bed because it’s chock full of such useful baking info, such as why certain techniques work and variations on recipes to suit your preferences. Then I dream of baked goods all night long, of which you’ll hear no complaints from me because dreaming = no calories. Let it be known: this brownie cake is fudgy to the extreme! I recently learned (per the above cookbook ) that fudgy brownies are the result of first melting the butter and chocolate together before adding the rest of the ingredients. Contrast that with cakey brownies, which begin with the butter and sugar being creamed. 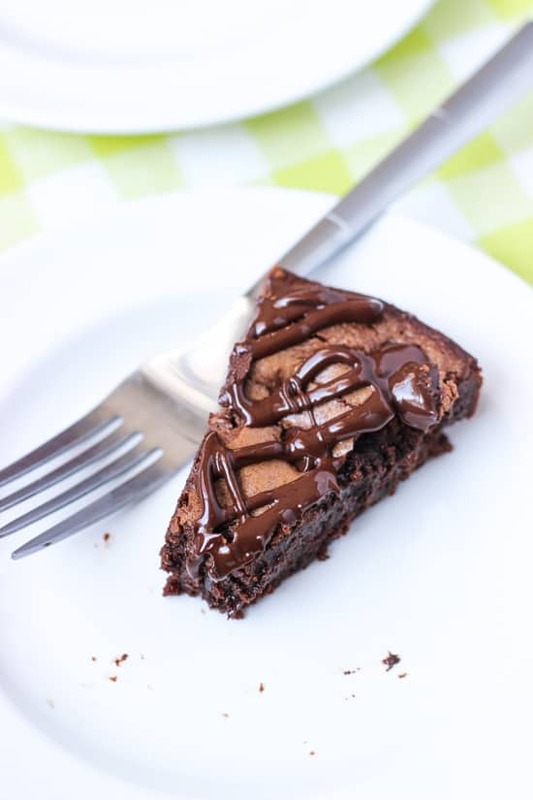 We’re 100% fudgy brownie fans over here so that’s the way I’ve written this brownie cake below, but feel free to switch up the steps if cakey is more of your thing! 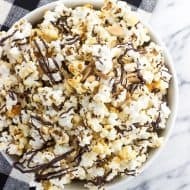 I used dark chocolate pretty much every chance I got in this recipe, except for some semisweet chocolate chips added along with dark chocolate as mix ins. The beauty of brownies is that you can really stir in whatever you want. Nuts, chips, candy – anything! I also added instant espresso powder to the batter to really amp up the chocolate flavor, and it doesn’t disappoint. More is more in my mind when it comes to chocolate (am I wrong?). In keeping things as simple as possible, I melted MORE dark chocolate and drizzled it over the top for a truly decadent dessert. Mmmm not sorry about that. That method comes highly recommended, but a dusting of powdered sugar, festive candy and sprinkles, or even frosting would work too. This fudgy, rich dark chocolate brownie cake is loaded with two kinds of chips and decorated with a simple dark chocolate drizzle. It's an easy dessert to feed a crowd. Preheat oven to 350 degrees F. Grease a 9" round cake pan with cooking spray and set aside. In a medium-sized, microwave-safe bowl, add butter and 1 cup of dark chocolate chips. 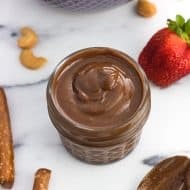 Melt in 20-30 second intervals on half-power in microwave, scraping the sides and whisking between intervals, until butter and chocolate are completely combined and smooth. Alternatively you may also use a double boiler to melt butter and chocolate. Transfer butter/chocolate mixture to a mixing bowl and add sugar. Whisk until sugar is thoroughly mixed in. Add eggs, one at a time, whisking after each addition. Add vanilla extract and whisk again. Add flour, salt, and espresso powder and whisk until dry ingredients are fully mixed and batter is smooth and a bit shiny. Stir in remaining 1/2 cup dark chocolate chips and semisweet chocolate chips. Pour batter into prepared 9" round cake pan and bake for 24-30 minutes, or until a tester inserted in the center comes out clean. 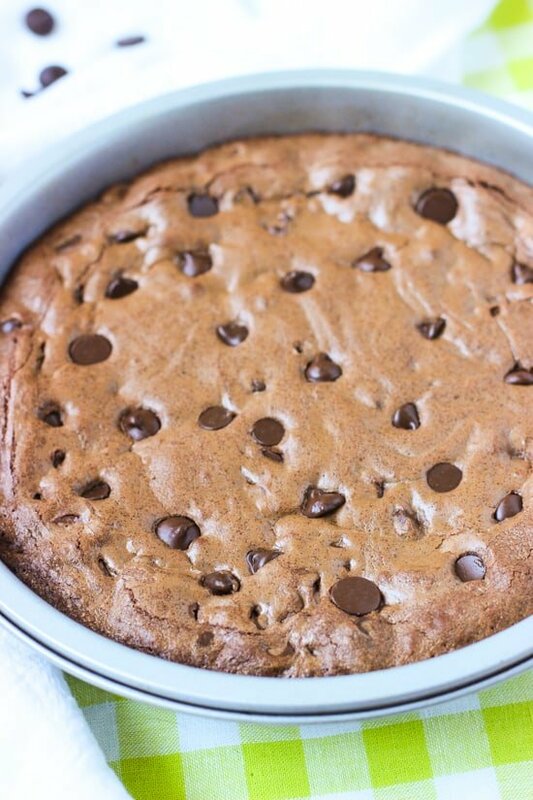 Let brownie cake cool in the pan for a few minutes before decorating, and then fully before slicing. To decorate, I melted about 1/4 - 1/3 cup dark chocolate chips, adding melted chocolate to a plastic bag and snipping a corner to pipe the drizzle. Decorate as you like! 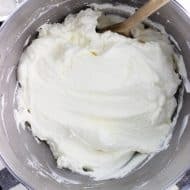 If you'd like to remove the brownie cake from the baking pan and serve on something else, I recommend placing a round of parchment paper on the bottom of the pan and spraying parchment with cooking spray. This will make it much easier to flip the brownie cake over and invert back onto a serving plate without losing any of the bottom of the cake. Brownie recipe adapted from The Art & Soul of Baking by Cindy Mushet/Sur La Table. 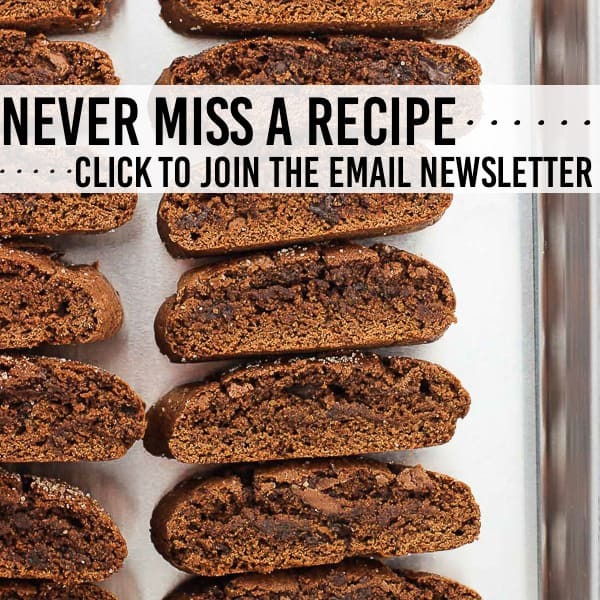 Can’t get enough of brownies? I can’t blame you! 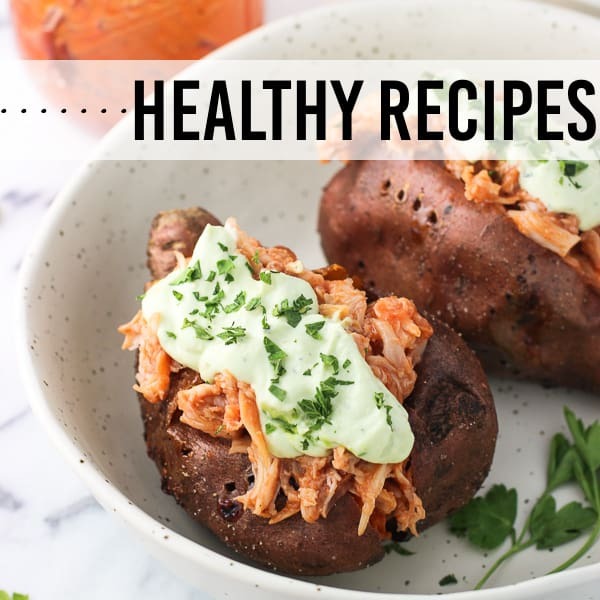 Check out these fab recipes, too! This looks so good! 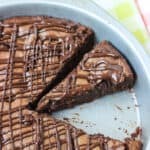 It’s my friend’s bday in a few days and I am searching for brownie cake recipe as she loves brownies. Will definitely be making this one! Thank you Nisreen, hope you enjoy!! She loved the cake!! Thanks for such an easy and yummy recipe Alyssa! Good day, Alyssa! 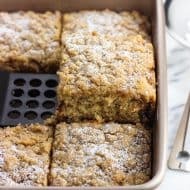 I’ve been drooling over this recipe for a very long time and I’ve finally had a taste of these just today! It’s actually my first time to bake and it turned out splendid! Everybody loved it! Even my picky eater loved every bit of it. I just had a few difficulties while baking because maintaining the 350 degrees was difficult with the kind of oven that i have plus the windy area. I only used a bar of dark chocolate for this omitting the semi sweet chocolate chips, but it still turned out sweet which was a very big plus. We’re going to bake this one again tomorrow with 50% less sugar and butter. It’s been such a long time since I’ve eaten such a great tasting brownie. It’s decadent, moist and fudgy, just like what you said! However, due to different factors, the edges of my brownie somehow turned crispy, but still very chewy at the same time. The center was great! Moist, soft, decadent, fudgy and every bite was so chocolatey that all of us couldn’t help but really munch into it! Homemade brownies are just the best! This one looks soooo dense and fudgey. 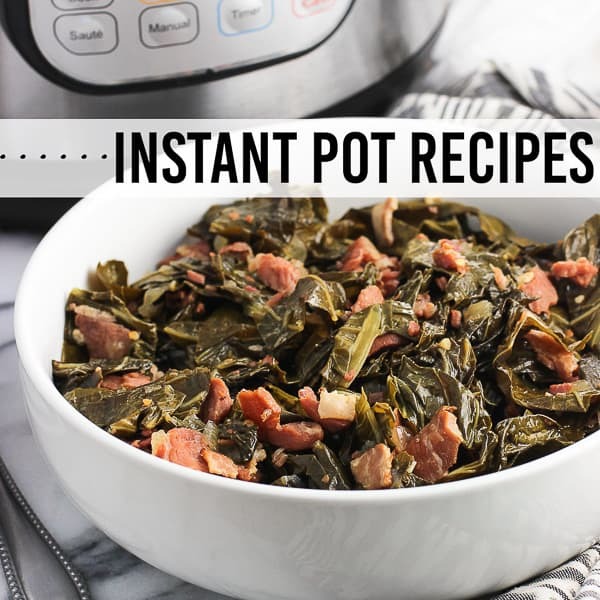 I love that all the ingredients are things I keep on hand, so this is a good go-to when I have last-minute guests! This looks like a great way to relax after a stressful week at work! Why do brownies look so much better in pie form too? Love this! I’ll be with you in spirit easter week as I’ll be working too. I think I’d better make myself a cake like this to ‘drown my sorrows’. Love the idea of brownies in cake form! Ummm this looks absolutely delicious. 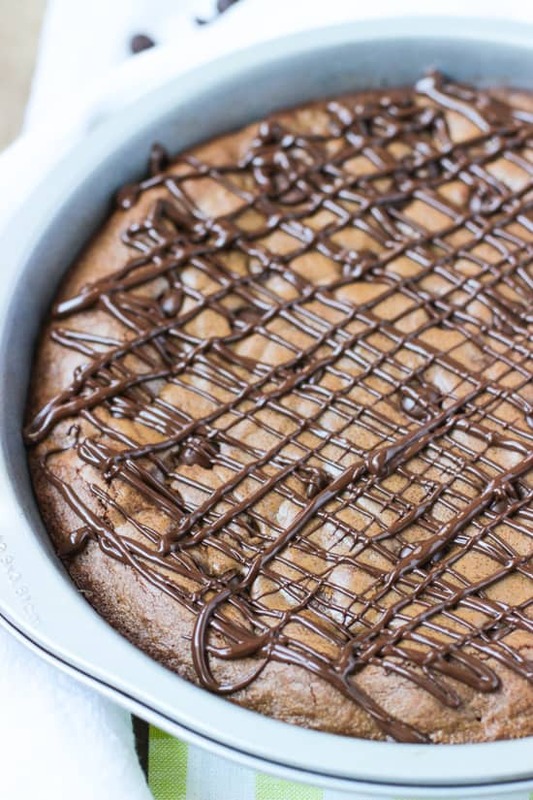 I would just be scared of eating the entire pan….lol…looking forward to giving this a try but will make sure I make it when guests come over. Haha Mabel I’m not going to deny that the thought of eating the whole pan didn’t cross my mind… 🙂 Thankfully I’ve had some help with this batch! Give me all the chocolate!! This looks amazing! 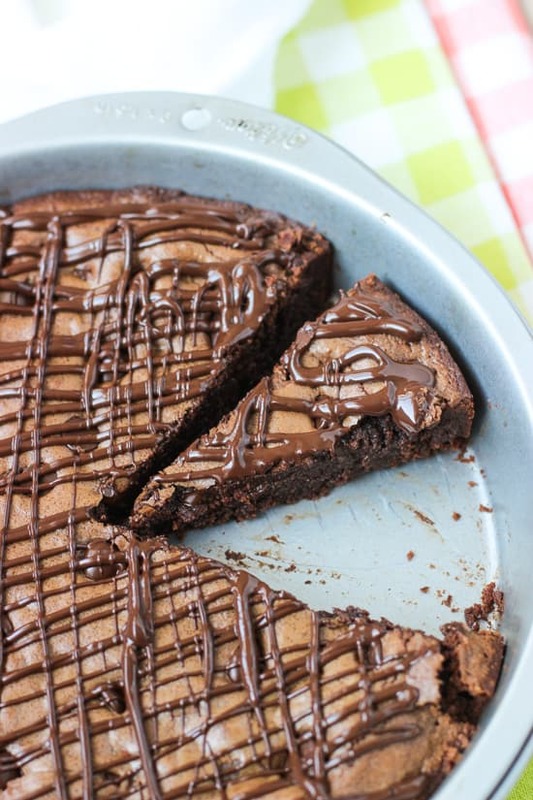 I love fudgy brownies, they are so much better than cakelike brownies! Fudgy all the way Annie! This brownie cake is definitely more decadent than what I typically make but sometimes rich and ultra chocolatey is necessary! 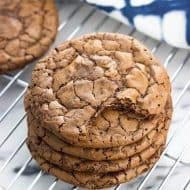 This looks so chocolatey, gooey, and decadent! 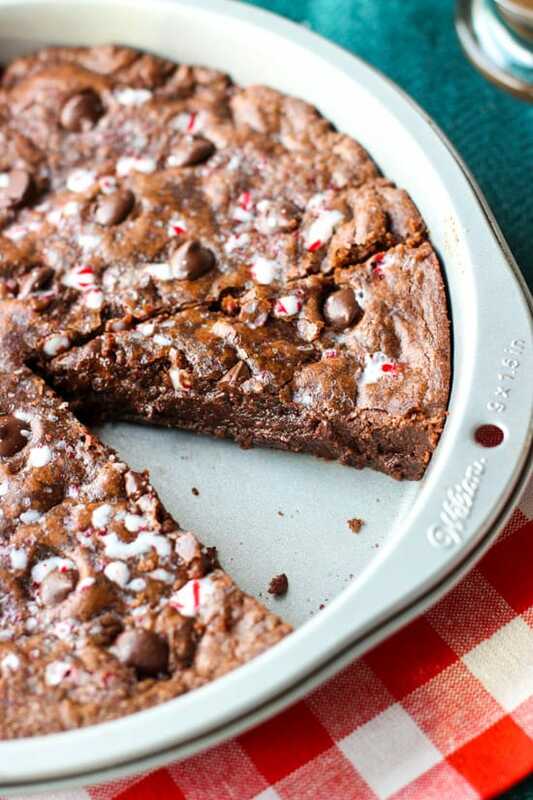 Brownies are my favorite — this cake is right up my alley! This is going to be a rough few weeks of work for me, too, but this brownie cake would most definitely help me through!! It’s beautiful! Ooh I feel you, Sues! Looking forward to breathing (a bit) easier at work. In the meantime…there will be chocolate haha. Thanks! I can’t imagine being an accountant this time of year! I would need ALL THE CHOCOLATE. This looks amazing! Haha Ashley it’s busy, but not as bad as it could be so I’m thankful for that! Nevertheless I packed myself a hefty slice of this brownie cake today as a work snack. 🙂 Thanks! Now this is my kind of cake! I love the the mashup of brownies and cake, Alyssa! And I’m really craving this for breakfast! Pinned!